If you’re born in Arundel you’re known as a mullet – not because it’s a given you’ll have a laughable hairdo, but due to the presence of mullet in the River Arun, which cuts quietly through this West Sussex town and bestows it with even more charm than it already has a right to. In fact, were you an Anglophile, you might just fall over in a paroxysm as you take in its cobbled side streets, quaintly wilting facades of timber and brick houses and the twin bookends of its cathedral and imposing castle that sit on opposing hills pondering one another. It is at the castle that you might want to start your visit; durind the school holidays they frequently run events with little ones in mind, from reinacted jousting tournaments to living history days where folk in ancient attire regail you with tales from the past. Built in the late 11th century under the reign of William the Conqueror, the castle has been in the family of the Duke of Norfolk for over 800 years and its handsome, fairytale looks have seen it used in TV series as varied as Doctor Who, MacGyver, and Oscar-winning film The Madness of King George. 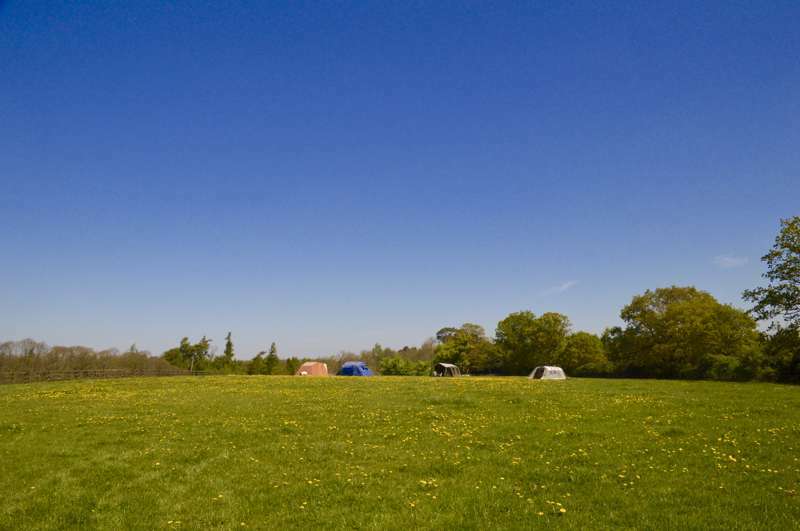 Equally regal for its stunning views of the castle town, and majesty of its natural environment in wild meadow, is Billycan Camping. If you’re looking for style and comfort combined with an earthiness that takes you back to the days of your camping forays as a child, then you’re in luck. In the words of its co-founder Alex: ‘We’re family camping, not glamping, a place where kids can meet and like-minded adults get together around the communal campfire.’ But don’t let her fool you entirely, for while their tipis and the setting may be rustic, the general style of the place is really something. How many campsites have a communal safari tent that looks like a Bedouin palace – with fur throws on the floor, Moroccan lamps, and wicker chairs? It’s beautifully eclectic. Even the communal washing-up tent is photogenic. And we haven’t even mentioned the interiors yet, whose bunting, shabby-chic throws, and bed linen have had newspaper travel editors waxing lyrical about this place. The other founder, Sue, is a dab hand in the kitchen and alchemises homely stews to eat round the campfire on Friday evenings. She also prepares breakfast hampers bursting with pastries, jam, organic bacon, and eggs – delivered to your tent on Saturday mornings. Everything about Billycan, from the fairy-lit bridge to the beautiful view of the distant castle, is soothing and designed to unravel the city out of your system. This winter they’re planting a wild meadow here, so by the time you read this the air will be a flicker with butterflies and the scent of flowers. Book ahead, though, Billycan is deservedly chock-a-block with Boden outdoorsy types and young wannabe pirates. This deserves to be one of the best campsites in Sussex. Campfires in private fire pits and there’s also a communal fire. 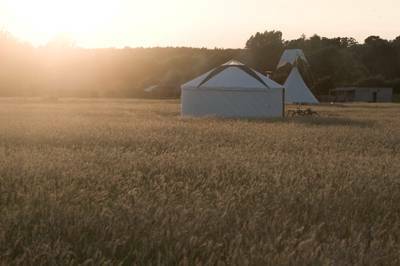 Two tipis and 8 bell tents generously spread around 7 acres of field, each one individually tastefully decked in shabby-chic style, bunting, and cosy throws. Shower and loo cabin and a communal tent like Aladdin’s cave. Also there’s no electricity here, so pathways are lit by tea lights. Look out too for the pretty fairy-lit bridge into the adjoining field. Big Dave’s Bike Hire (£15 per day) is on site – perfect with Arundel close by and the river towpath. There’s also face-painting on Saturday mornings, and art classes for the kids. And if that’s not enough you can talk to owner about organising a spa treatment for yourself: aromatherapy, an Indian head massage, reflexology for those weary feet after walking to town and back, or a full-body Swedish massage. Treatments range in price from £20 for half an hour and £30 for an hour. 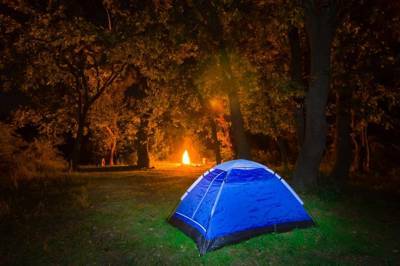 Who can offer campfires beneath the starry skies? Who can offer a communal tent that looks like Aladdin's cave? Who can offer scrummy food hampers and unbeatable views? Billycan. And it's all waiting just for you. Children will love the castle (01903 882173; Arundel Castle for its weekend events like jousting or ‘have a go pirates’ – involving archery classes and fencing. For adults, the castle’s gardens and interiors are a fabulous salve to the tired imagination. 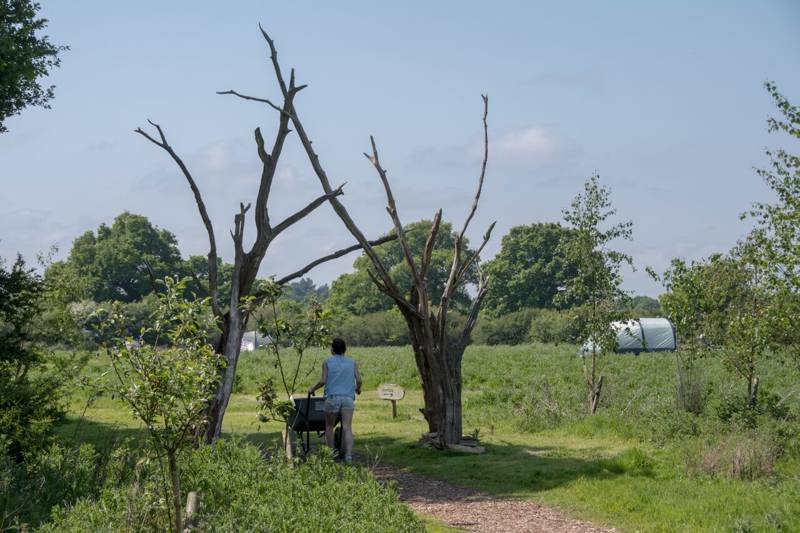 There’s Arundel Lido (01903 882404) for sweltering days, and nearby is Arundel Wetland Centre (01903 883355), where you can take a boat safari through the habitat of rare and endangered species. Eminently walkable from the site is West Beach, ideal for swimming and spotting lizards and oystercatchers. Your hampers will keep you happy for breakfast, and there’s a great communal BBQ for snorkers, but should you want a little more refinement head into Arundel to Pappardelle (01903 882025) for freshly cooked Italian cuisine and home-made puddings. And just in case they’re feeling neglected, there’s a rather nice service we should mention to the dads – Arundel Brewery can deliver its delicious ale to your tent so you needn’t even leave the site for your evening brew. Grand Tipi (sleeping 5) £350 per weekend (including hamper and Friday dinner)/£600 per week (Mon–Fri). Bell tent (sleeping 3) £195/£399. Bell tent (sleeping 5) £235/£425. Bookings last from Friday through till Sunday or weekly bookings from Monday to Friday. Head past Arundel on the A27 towards Chichester. Then at the first roundabout outside of town take your first left, on to Ford Road for about a mile and you’ll see Billycan on your right – look out for the white tents in the field through the hedge. It’s easy to miss, so keep your eyes peeled. If you get to Arundel you’ve gone too far. Take a train to Arundel, from where it’s easier to catch a cab to the site or walk the 15 minutes. Call site for directions.